Champions for Children has been continuously nationally accredited by the Council on Accreditation (COA) since 2004. The nonprofit, peer-driven COA seeks to improve delivery outcomes by accrediting organizations that demonstrate best practice standards in the field of human services. COA accreditation ensures that we are providing the very best possible services to our families and is a mechanism that enables Champions for Children to continually improve and evaluate the way it delivers services. The standards are intended to ensure that services are well-coordinated, culturally competent, evidence-based, outcomes-oriented, and provided by a skilled and supported workforce. Although the formal part of the accreditation process has been completed, our work is far from over. COA accreditation is not an end in and of itself. Rather, it is a process by which our organization can consistently strive for and achieve new levels of excellence. Over 2,000 organizations — voluntary, public, and proprietary; local and statewide; large and small — have either successfully achieved, or are in the process of, accreditation. Achieving COA accreditation means our organization is among the best in the field. 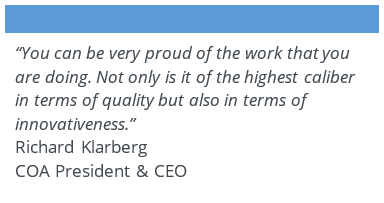 We are proud to be a part of this community of excellence. 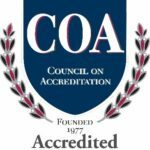 To learn more about COA accreditation, please visit www.COAnet.org.